The can of ambrosia is a healing artifact made in one of the few alcohol factories in Godville that doesn't produce beer, and for that exact reason the location of the factory is kept secret from Godville's heroines. Nonetheless, the can of ambrosia is quite common and affordable. 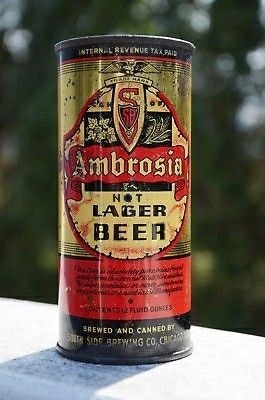 The reason for selling the ambrosia in a can, rather than a bottle, has not been officially explained. Rumors say the can's metal reacts with the ambrosia to produce an addictive effect in the heroines' bodies. Despite being sold exclusively as an alcoholic beverage, the ambrosia is said to have healing properties (the efficiency varies by heroine). Although it is sold as a healing artifact, many heroines just drink it for the taste. Often they reuse the can afterwards, according to their imagination: putting another liquor into it, playing "fetch" with pets, wearing as a hat (or something else) in a one-man show, etc.